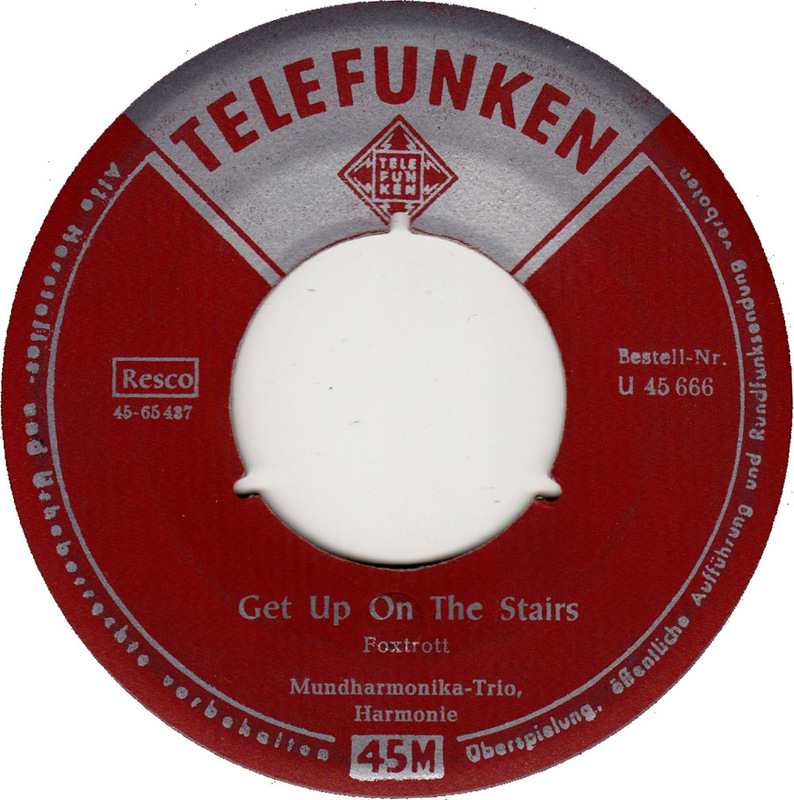 A couple of month ago I found this 45 by Harmonika-Trio Harmonie in the 50 cents bin of a local second hand store. The record didn´t have a sleeve and was lumped together with a bunch of other sleeveless 45s. It looked pretty scratched up and dirty. However the titles Get Up On The Stairs and June Night sounded promising, like they might be some kind of jazz. So took it home, cleaned it and it didn´t sound so bad. And once you get behind the harmonica sound, the songs are great too. Apparently Trio Harmonie was a top German jazz group in the late 40s and early 50s. As I will show in the next couple of posts, all sorts of groups used to be very comfortable playing the current hits of the day with their unlikely instruments. It was this sort of diversity in styles and adaptions that made jazz so popular. 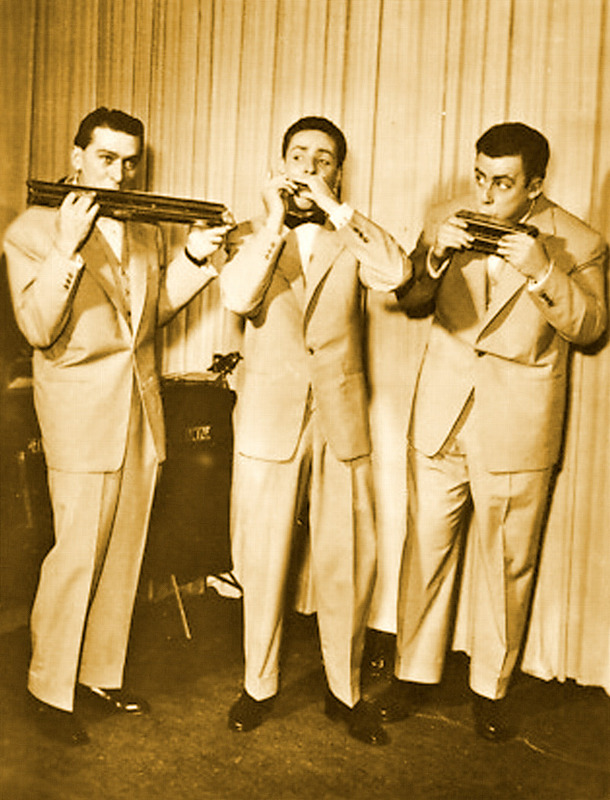 Groups like the Harmonica Rascals and the Harmonicats and dozens of others were a regular part of the entertainment business in the 30s and 40s. In Europe one of the most popular harmonica groups was the Dutch Hotcha Trio who started as a five piece group in the mid-30s. In Germany harmonica groups were especially active in the post war era. 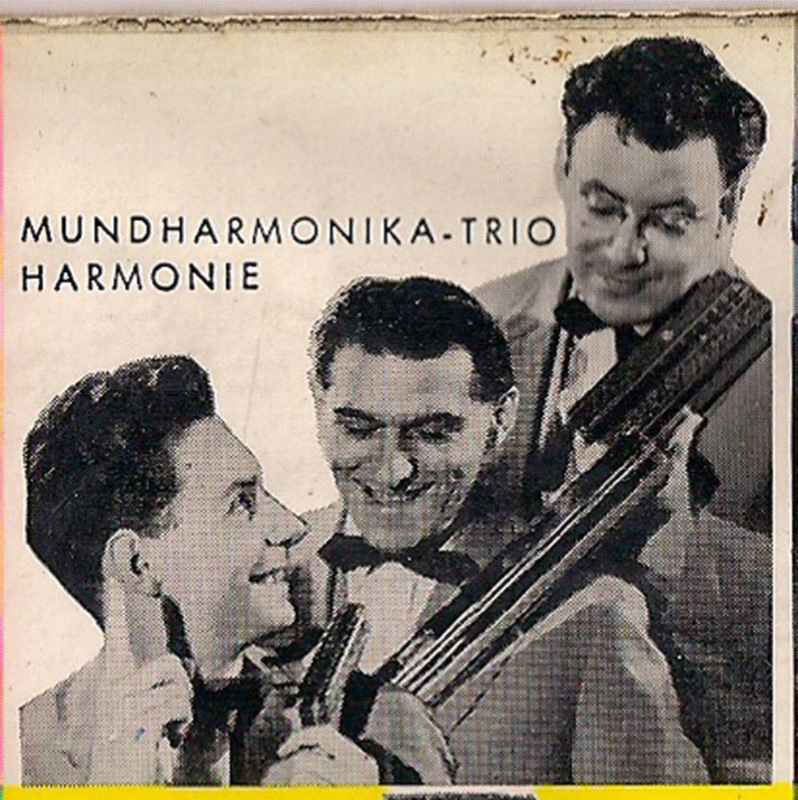 One of the first outings of Harmonika-Trio Harmonie (with members Rolf Balschun , Günter Koerber and Max Fricke) was a version of St. Louis Blues , recorded in Berlin, October 1948. No information about the group on the Internet and no full reissues either, but their very nice up-beat harmonica version of Don´t Be Cruel has been featured on a compilation of German cover versions of Elvis songs. Last week I went back to the same second hand store and found two more 45s by Trio Harmonie in the same bins. Back home I realized that all three were from the same collection as the numbers on the small record album stickers indicate. These records have probably been sitting in those boxes for years, ignored by both jazz fans and record collectors. All the way from Austin comes this image and two more tracks from Mundharmonika-Trio Harmonie, taken from Die Illustrierte Schallplatte 2. 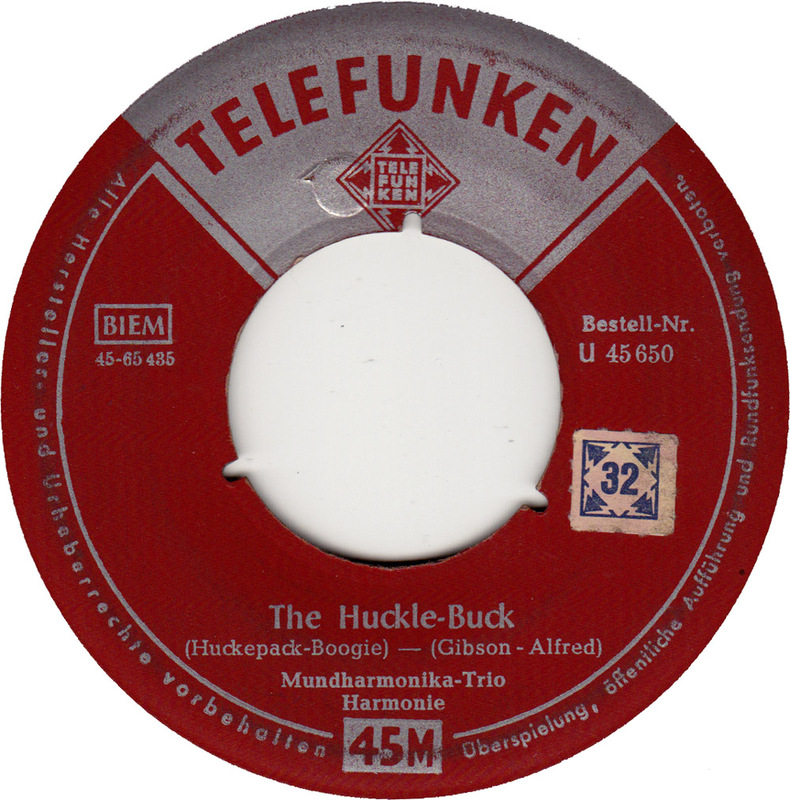 Folge (Telefunken LA 6125). A great find. Thank you. Your efforts are always appreciated. I have a german schlager compilation from the late 50’s with 2 tracks by Mundharmonika- Trio Harmonie & there is also a pic of the group on the album. The track titles are Tweedle-dee, & A-Ting-A-Ling. The compilation is called “Die Illustrierte Schallplatte 2. Folge” (Telefunken LA 6125) . I´d love to add the photo of the group and the songs to my post. As I wrote, only a small portion of their material has ever been reissued and nobody has written about them yet. By the way, your blog is great! Nice choice of obscure music from around the world. and the photo of the group. Unfortunately, the tracks are incomplete because they are interrupted by commentary of Hans Hellhoff (I assume he was a radio commentator or something? I don’t understand what he’s saying though). Thanks a lot for your effort! I added the tracks and the image to the post. Nice to see you have discovered the Mundharmonika Trio Harmonie, I discovered them while doing my National Service in Germany in 1953/54. I feel sure that there must be a lot of other of their recordings still undiscovered. Addio Amore, Harmonica Dixie, Boogie Woogie and Don’t be cruel but unfortunately I can’t upload them.